Yes, I have finally found time to get back to posting. As the title to this post, suggests, January was a different sort of month for me. And before I continue please note that I am very aware that many of you have stood in ‘these shoes’ before me; and like so many things in life, it’s just a whole different story when ‘it’s your turn’! 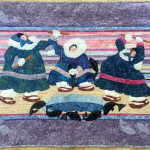 While I do like to keep my posts focused on quilting, wool work, handwork, pattern designing, etc. I also realize that we cannot always ‘compartmentalize’ the activities and events of our daily lives. I have decided a few things but those decisions are all based on the fact I will remind myself each day of all that I am blessed with and to appreciate what I have; to make sure others know how much I love them; to choose happiness. I’ve been around enough to know life is never really simple; it’s all in how you play the game. All that said, I can now laugh and say how I’ve spent the past couple of weeks just trying to ‘make up’ for the lost weeks of January! 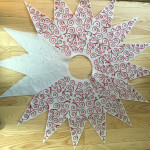 I have tackled a pile of quilt tops, determined to ‘finish’ them. This can be a problem for a hand quilter! 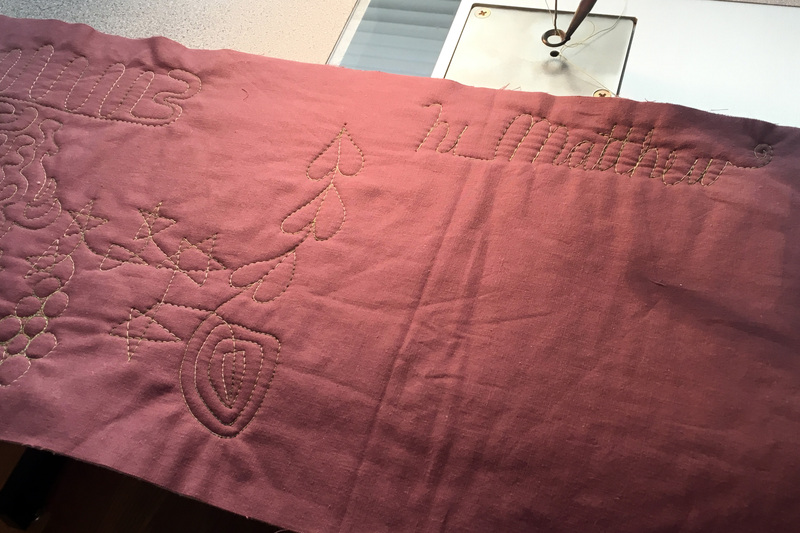 At one time I was going to take a class on a longarm and then rent the time – sadly the shop nearest to me closed down and there is nothing near enough to me to make it work. 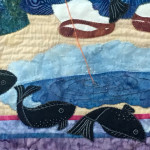 I looked at the cost of having them quilted (not easy to do on a fixed income!). Then I tried quilting a smaller sized quilt on my domestic. Yikes! 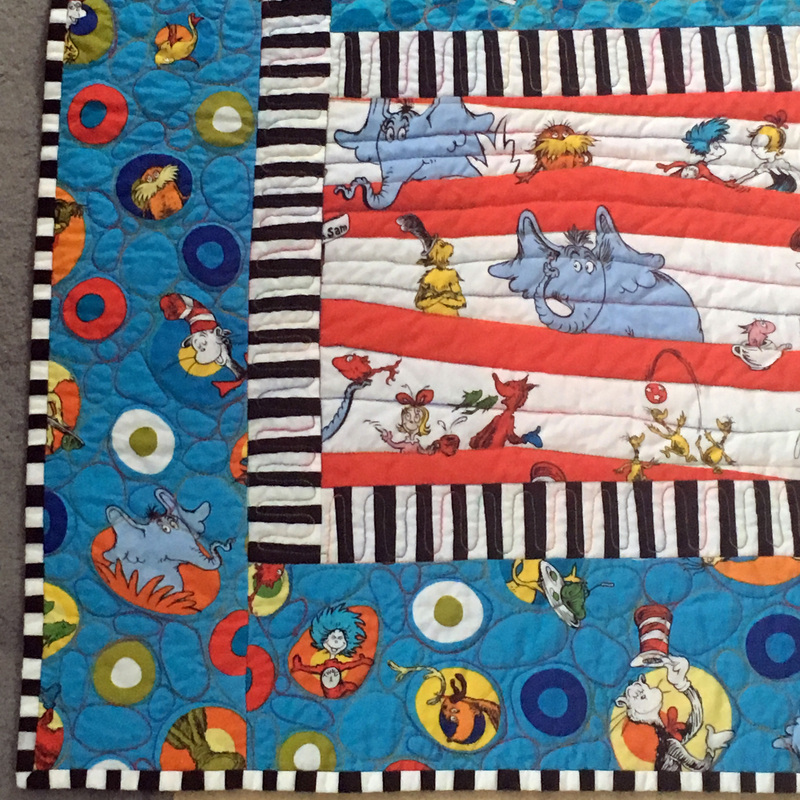 The photos above show the Dr.Suess quilt I used for this ‘adventure’! 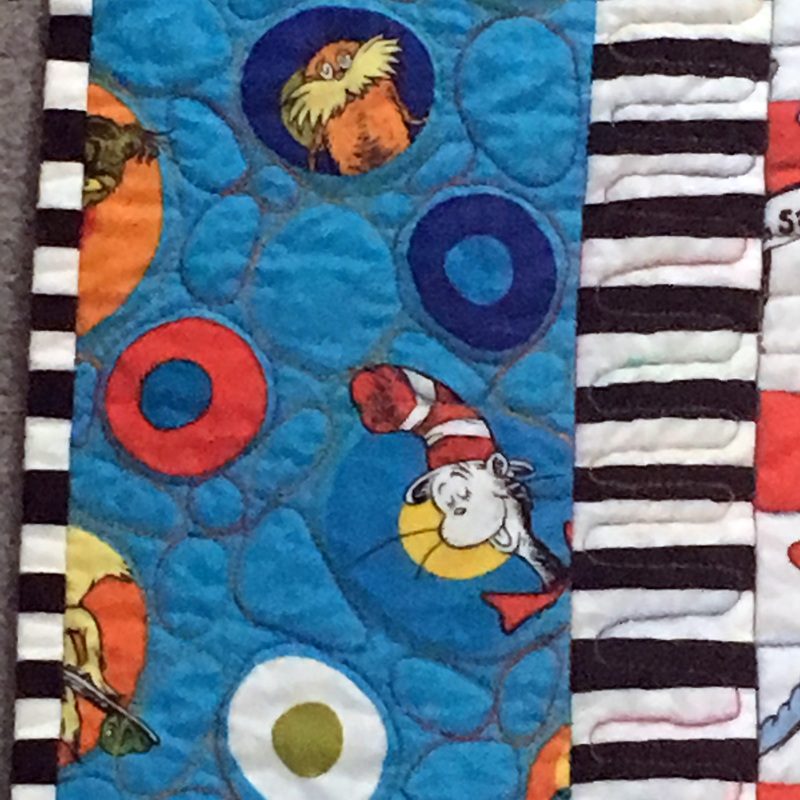 🙂 Kind of looks like I invited the Cat In The Hat to quilt it (not to mention that the thread bled after washing!) After 3 days of listening to my growling, cussing (yes, sorry!) and evident frustration, my dh suggested that perhaps I needed a new machine! (bless that man!) NO says I! 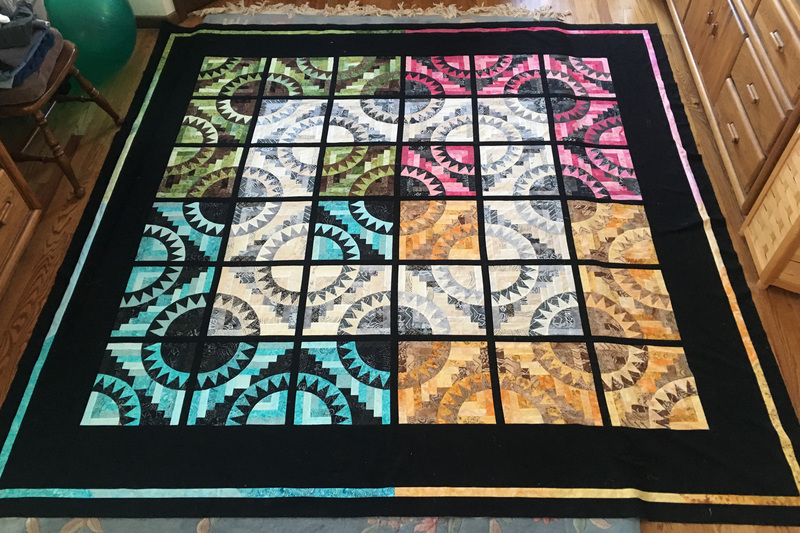 I like my machine, it’s just extremely difficult to quilt bigger quilts in that small throat/harp space, especially if you have FM and it is physically challenging! So given the sort of January we were having, dh encouraged me to consider using a bit of my IRA funds and look at the possibility of getting a sit down quilting machine- most likely a used one. As he reminds me “This is not a dress rehearsal!” I usually need this ‘encouragement’ as I come from a very frugal background! However, seeing the potential of being able to finish more of my ‘ideas’/quilts, freeing up time to choose what quilts I want to hand quilt, and also the possibility of making quilts for charity, led me on a research mission to see what the possibilities out there were. Fast forward two weeks: I have purchased a used 2007 ‘George’ mid arm, sit down machine with a 20″ throat. After checking out a few different brands, I found this through APQS. I can’t say enough good things about my experience with them. 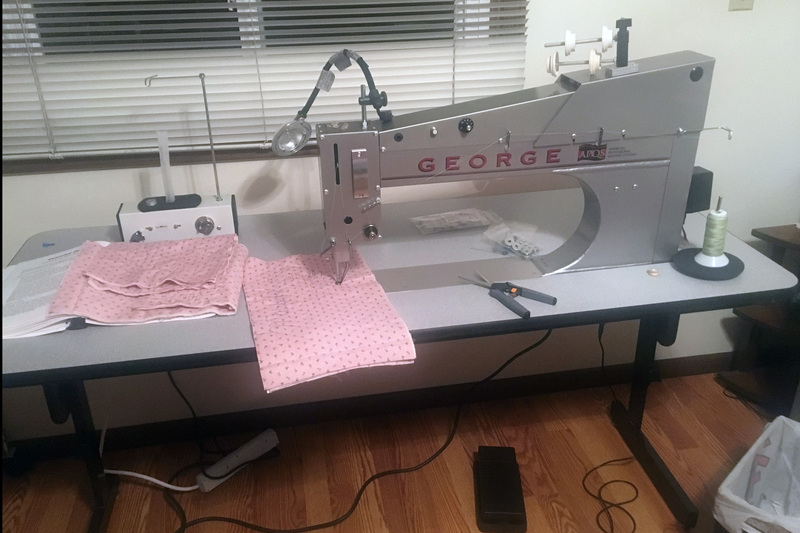 They were sooo helpful, informative, and the machine was factory refreshed, coming with a new table, inductrial bobbin winder, and an assortment of threads, bobbins, a USB loaded with videos, as well as a manual, etc. They have a great forum on their website (you can find used machines sold by individuals here) and APQS also has a list of used machines for sale. 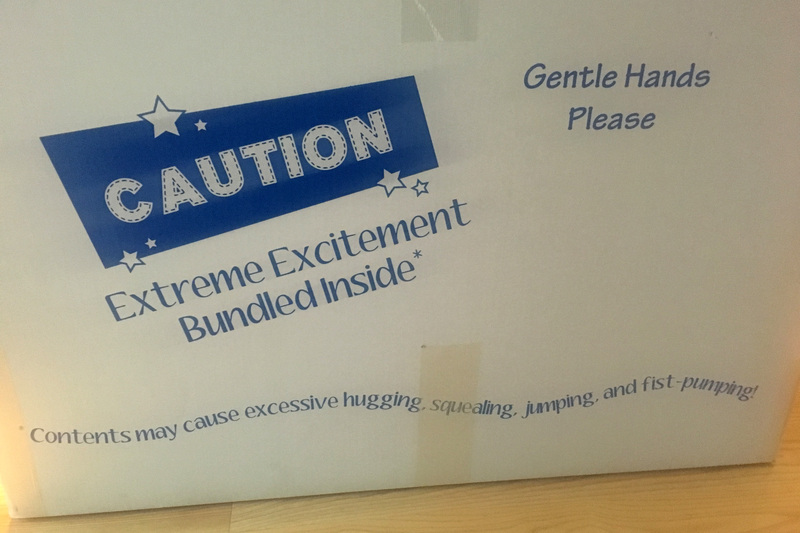 How fun to pick up this box! First practice fun with George! Getting George meant room redecorating! Of course, getting ‘George Devine’ meant finding a place to put him. [FYI – I really did have an Uncle George Devine! He was an incredibly wonderful man; very Irish, made me my first stilts, showed me how to get the money out of a slot machine, loved my aunt dearly, and left this life way too early!] 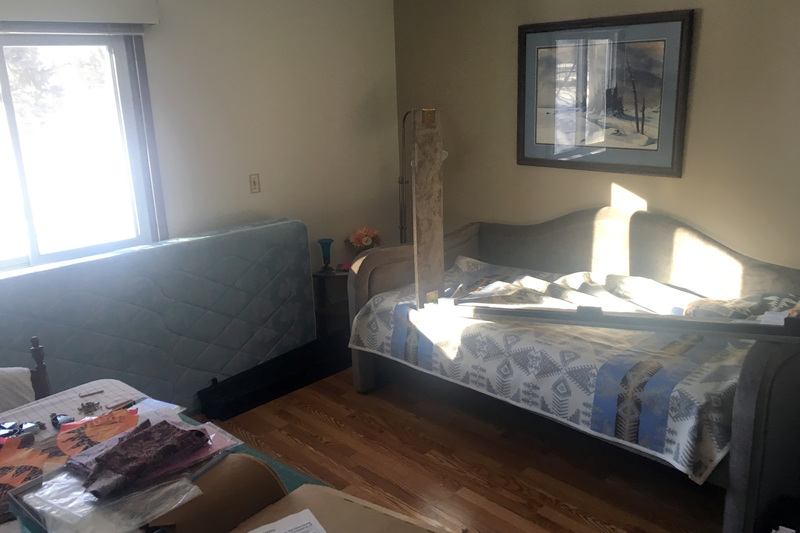 This entailed room renovations; replacing the two twin beds that had been moved together for a king sized bed with a trundle day bed which will provide guest sleeping with a much smaller ‘footprint.’ My dh also put together another rolling rack for my wool/sewing supplies. 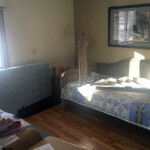 The photo above shows the room in mid renovation. We now have George all set up, including a matching table that sits behind him and will hold the larger quilts I tend to make. I will have to take another picture for the next post. I’m still waiting to get a chair that puts me at the correct height. 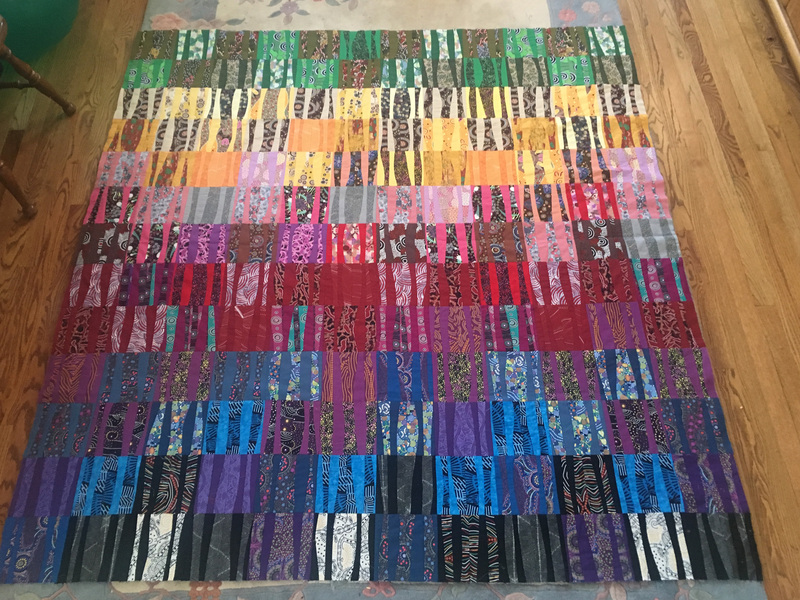 While all this waiting was going on, I finished piecing a quilt for my brother – he’s a tennis pro and has traveled extensively, including a trip to Australia. 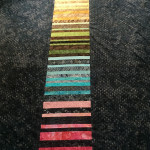 At the spring market, I was able to purchase 4 jelly rolls of aboriginal fabric. 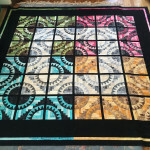 This is the quilt I came up with, but I have to give my dh credit as I made the squares and handed them to him to arrange as he saw fit: I think he did a terrific job. Have I told you that my dh is also an artist?? 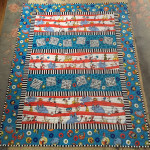 This quilt top has been prepared and will be one that will be quilted on George. 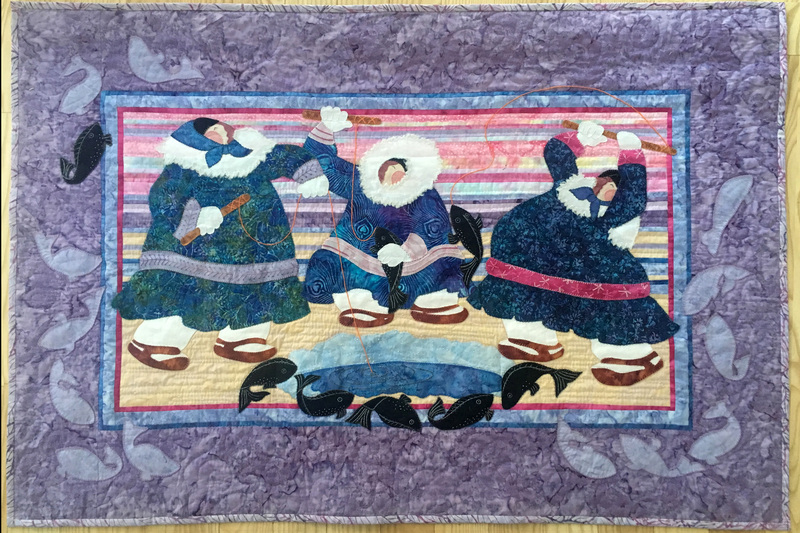 I also finished a very old project that was done in my Daystitchers group somewhere around 2002 or so. 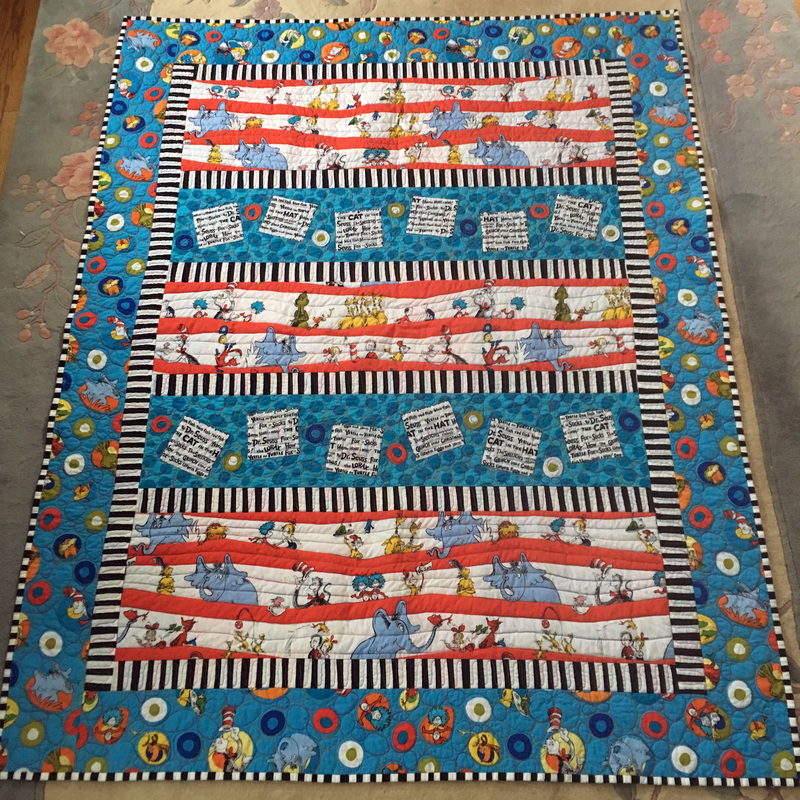 It was a row quilt and the first time I ever participated in this kind of group project. We chose our own fabrics, placed them in a box with any comments regarding our ‘tastes’ and every month we exchanged boxes, making a row that measured 48′. I’m not sure what was on my mind at the time, but it kind of has an sweet old-fashioned feel – not really my style! Go figure! But it IS special because of the friends who helped create it. I decided to use a more ‘utilitarian’ type of hand quilting for this. I am please with how it turned out! Another project that I was able to finish up, was this ‘Ice Fishing’ kit I purchased in 2011 on our bucket list trip to Alaska. 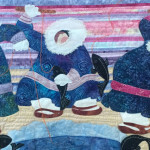 I bought it at the Changing Tides quilt shop in Juneau (I’m not sure they are still there under that name). I have never bought kits, as I generally have lots of fabrics and patterns and I’m not fond of following rote directions, but this was so reasonably priced and we also had to ship anything we purchased home because we were going places that had weight limits on bags on planes, etc. Barbara Lavalle is originally from Iowa, but not in Alaska she is a well known artist who paints and designs the most delightful pieces featuring Alaskan life. 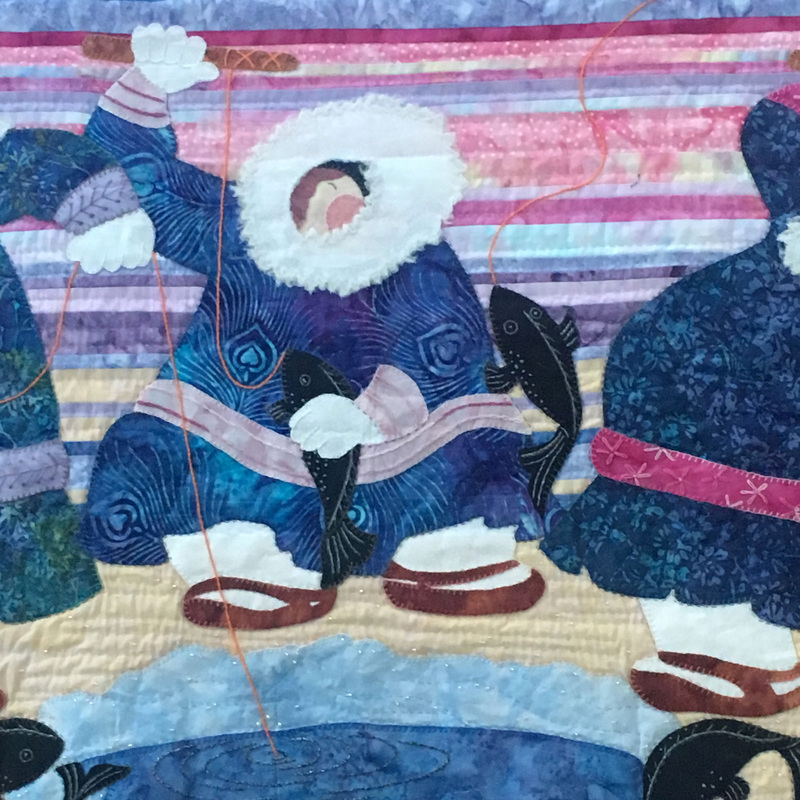 It was fun to put together, although I added a lot of my own touches – the fur on the hoods and cuffs, metallic thread and beads for sparkles, etc. I hand quilted it and it will now hang on the same wall that George is located on. It brings me nothing but good memories! I loved Alaska. Check off another project! 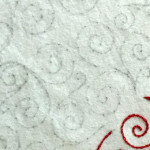 While I definitely focused on my own quilting projects these past months, I have not forsaken wool work! 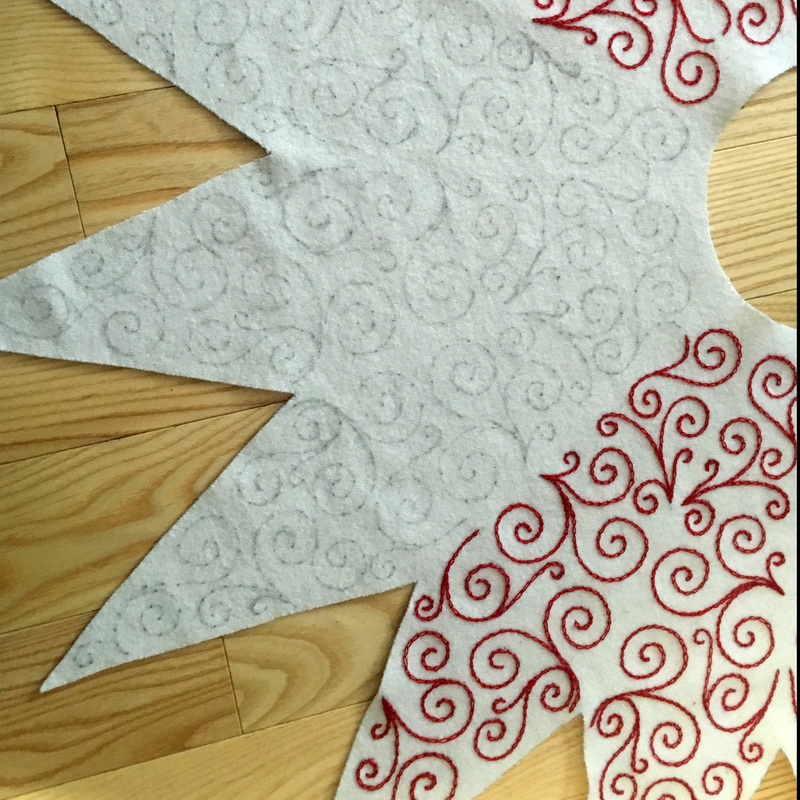 I have for years wanted to make a new Christmas tree shirt; I still have the Bucilla acrylic felt kit with pompoms all around the edges and snowmen on candy canes sledding around the edges! Mmmm..my youngest is in her thirties! Time for a change. But every year I would think of it too late to get anything done by the time we would set up the tree. So this year I started before the year ended. 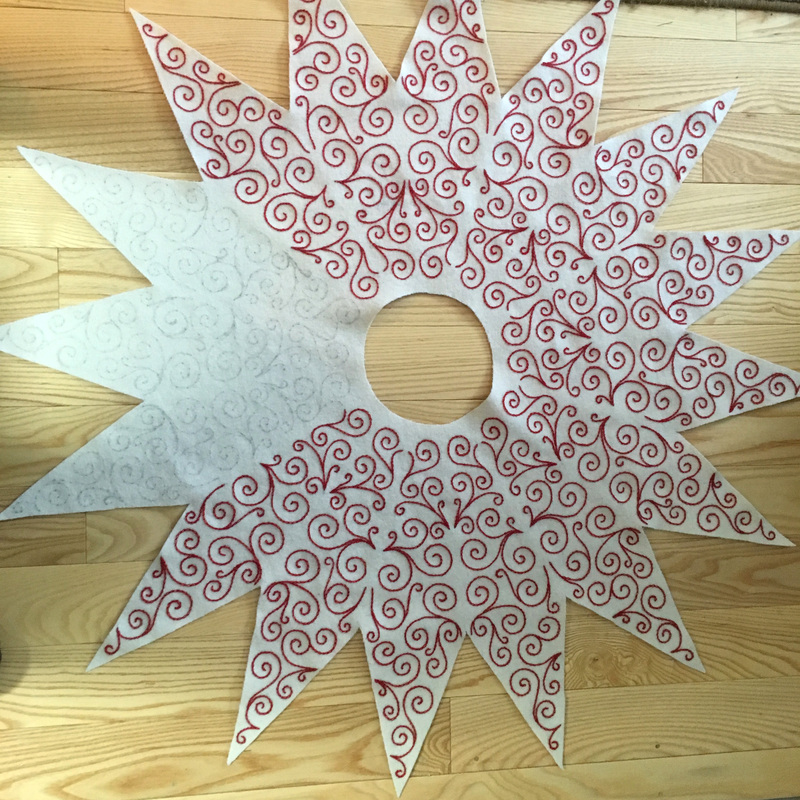 I have a red wool base that will have white wool snowflakes appliqued all around, and this chain stitched embroidered star in the middle. 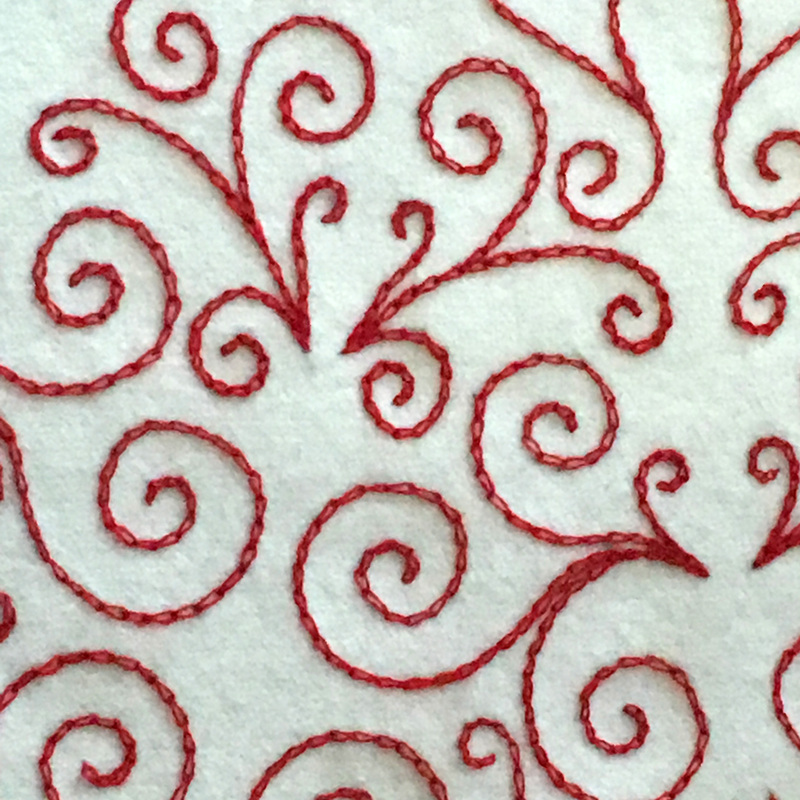 I chose to use plain red wool thread for the chain stitch. Marking the white fabric was going to be a trick. I decided to make a template of the design. I then punched holes along the lines. I marked these with a mechanical pencil and then drew the lines from dot to dot on the wool. For variety, I flipped the template over (side to side) on every other point of the star. The photos show the marking as well as the super close up showing the dots that were marked. 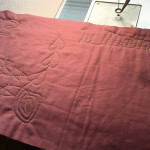 There is also the photo that shows the close up of the finished chain stitch. 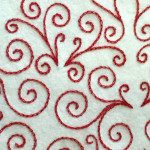 This is a perfect example of how one well executed stitch can make for an overall design. As I finish this project I will show pictures in future blogs. 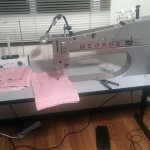 The last two photos show a quilt top that I now hope I will be quilting on George. This was a quilt top that was a major disappointment to me. 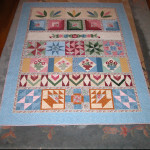 I had purchased a Log Cabin pattern by Judy Niemeyer after a local quilt shop did a presentation for our quilt group. The quilt that was shown and the picture on the pattern show a quilt in beautiful, somewhat southwestern colors. Unfortunately, as I began to prepare my fabrics, I became aware that the fabric colors used in the pattern were not at all the same. 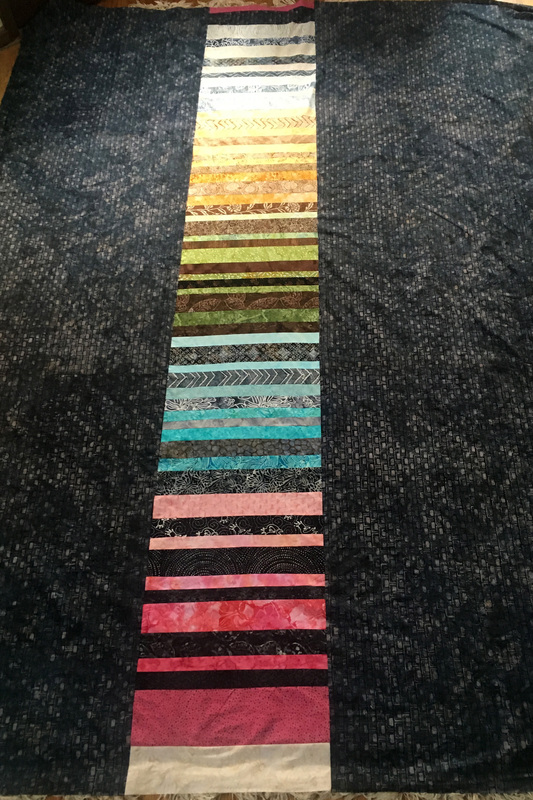 I chose to follow the quilt since her patterns involve a very specific technique and process. Once all the blocks were finished I realized how disappointed I was that this quilt would not be what I had thought. In the end, my son decided he loved it (reminded him of the ‘Simon’ game?!?!?) and with a few more modifications, we arrived at the above layout. I like the layout, etc. but this quilt simply wasn’t what I had wanted. 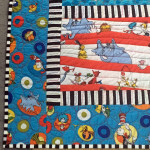 I did not want to spend the time hand quilting it and he was willing to have someone do it on a machine. Well, that was before George! 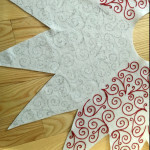 It appears that I will be quilting this on George after I’ve spent some time practicing (I have 2 other quilt tops ready to go for practicing). I think my son has more faith in my ability to achieve this than I have in myself! 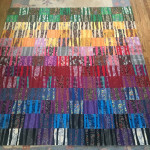 I included a photo of the pieced backing for this quilt. Oh my, this has gotten to be a long post…but then again I did get a lot of projects tackled these last weeks. Guess a January like the one I had will do that! Silver linings come in the strangest packages! For all you woolies out there, I have not forgotten about wool projects…they will be coming down the line. Meanwhile enjoy the anticipation of the coming spring. 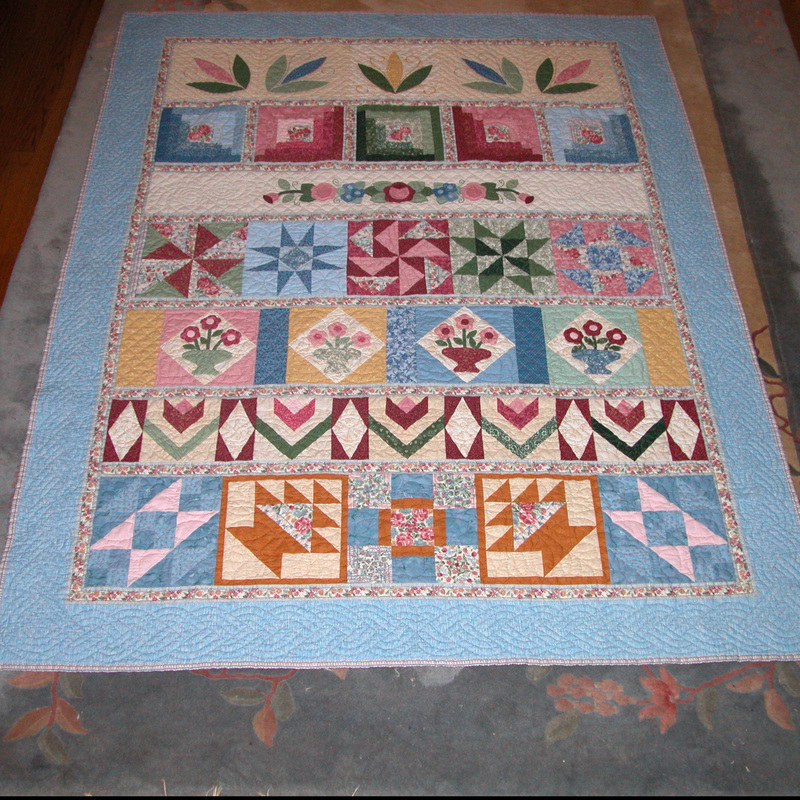 Nice to catch up via email… What a wonderful way to memorialize your uncle… Nice to see the row quilt done. 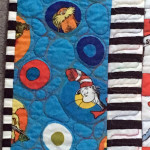 Mine needs binding & then it too will be done–YEAH! Fun to see what you have been working on. Impressed with how much you have accomplished since I saw you last. Hope to see you Tues. J. P.
Looking forward to having you back in town! Please include me on your blog and mailing list. Thank you. Hi Janice! Thanks for visiting my website and checking out my work! My website ‘features’ apparently do not include the ability to have a mailing list, or so says my son who hosts and does all the ‘techie’ stuff for me! So I am sorry that I am unable to offer such an option to you! (I did ask him about this when he set up the site!) He felt it was better to set up the RSS feed option. You can go to the main ‘Blog’ page (listed on the menu bar at the top of the page) and you will find a few choices; you can select an RSS feed(if I understand this correctly, you just need to have an RSS reader available) or you can follow me/DesignAndBeMary on via FB. I hope this will work for you. Again thank you for taking the time to check out my site!